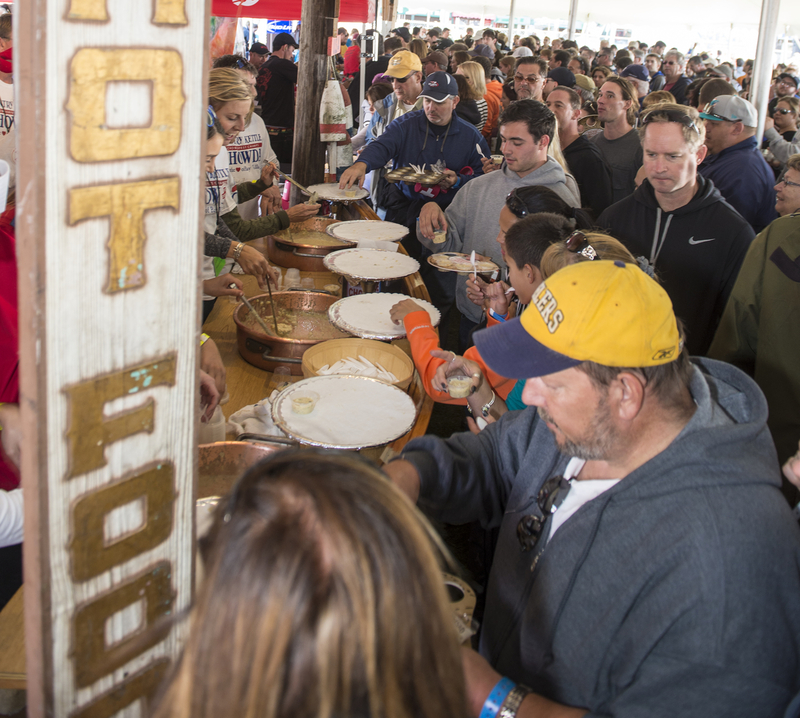 There are many elements that bring the Chowderfest together, beginning with hundreds of Southern Ocean County Chamber of Commerce Members and Volunteers. The event draws tens of thousands back to their summer retreats for the week, weekend or just the day. 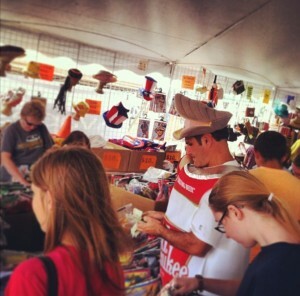 Festivities begin with the free Merchant Mart on October 3. Enjoy live music, children’s entertainment, beer on tap, cider wagons, gourmet food court as local vendors offer the best deals of the season under the big tents with holiday gifts, home décor, fashion, cosmetics, specialty products and Chowderfest merchandise from 10am to 5pm. Sunday, October 4 time for the cook off! This year in addition to Red and White Chowders, there is a Creative Seafood Category. This year’s competitors include The Black Whale Bar & Fish House, Lefty’s Tavern, Stockton Seaview, Shore Fire Grille, Southern Smoke and returning Red Champion Stefano’s Restaurant. White chowder champion Howard’s Restaurant will be defending against Chicken or the Egg, Country Kettle Chowda, TGIFriday’s Manahawkin, Buckalew’s Restaurant & Tavern, Sea Oaks Country Club, Pinzimino Trattoria, Mud City Crabhouse, Wally’s and La Bamba. First time entries in the Creative Class is Biggy’s Beach Grill, Cuisine on the Green, La Bamba and the Blue Water Cafe. Savor unlimited chowder from local restaurants and vote for your favorite, Sunday’s Cook Off is a ticketed event, General Admission Tickets $25.00 Children’s Tickets (Ages 4-12 ) $10.00 VIP Tickets – $55.00 (VIP ticket includes a T-shirt and exclusive early admission at 10 am) There is free parking throughout Beach Haven, and a free Sunday Shuttle for additional parking. 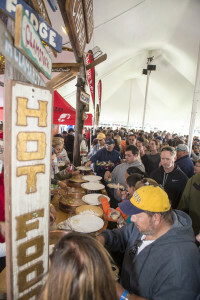 For tickets or more information go to www.chowderfest.com or contact Southern Ocean Chamber directly at 609 494 7211. Everyone gets a vote and the crowd chooses the Grand Champion and runner up categories. There is also a professional Critic Choice Award, which was founded by the late restaurant critic and radio host Ed Hitzel. For almost a decade Ed assembled the finest chefs, critics and restaurateurs to judge the restaurants in addition to the popular vote. The Critic’s Choice was changing over to a blind taste test this year, under the supervision of Mr Hitzel before his sudden passing this summer. The Chowderfest Committee and supporting critics have agreed to move forward as planned in honor of the dedication Ed put into the event. Mr. Joe Leone Introna, who dedicates his passion for culinary excellence, superior customer service & love of food to the Jersey Shore at Joe Leone’s Italian Specialties & Catering in Point Pleasant Beach & Sea Girt, NJ. joeleones.com. Mr. Peter Genovese Food feature writer for NJ Advance Media for NJ.com. Peter oversees the Munchmobile coverage and is author of ten books including topics on food, Jersey Diners and the Jersey Shore. Mr Edward Blake, Ed has served along with Ed Hitzel as a judge for many years. He brings a long experience as a hospitality recruiter with his firm Blake and Associates, as well as sitting on the board of Atlantic Cape Culinary School Foundation and Epicurean Society of Southern NJ. To complement the weekend, Long Beach Island Foundation is hosting their Second Annual Shellfish Soiree on Friday October 2 from 7-10pm. Tickets are $35 and can be purchased through the www.lbifoundation.org The Soiree promises guests an evening to celebrate art and science of Barnegat Bay through food, film, photography, performances and a distinguished Bay specialist guest panel. 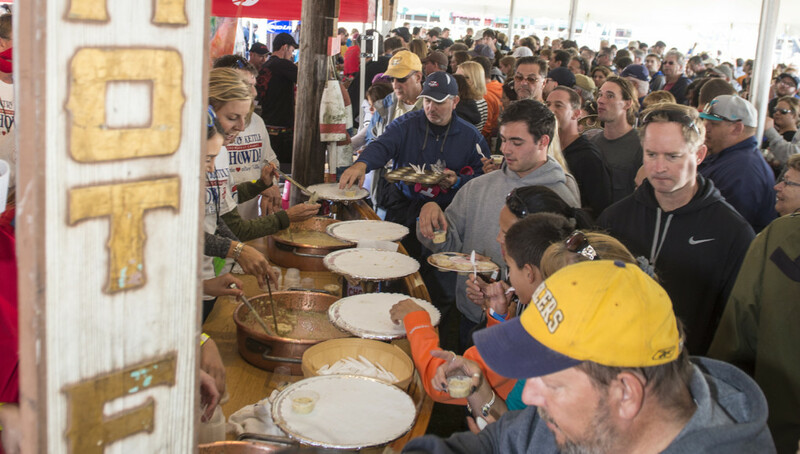 Follow The Official LBI Chowderfest Facebook page for updates on other festivities. 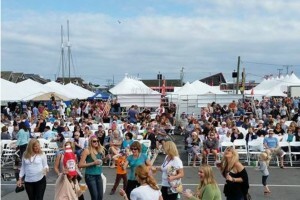 The Chowderfest supports the operation of Southern Ocean County Chamber year round visitor center, scholarships for three area high schools, popular events including Ship Bottom Christmas Parade, Barnegat Pirates Day, Maker’s Festival Manahawkin, Beach Haven Fireworks, Jetty Coquina Jam, David Dream and Believe Crusin for A Cure, Hop Sauce Festival and Long Beach Island Foundation of Arts & Sciences Discovery Days. For more information on this 101 year business organization or LBI and the Mainland communities, contact Southern Ocean County Chamber of Commerce online at www.visitLBIregion.com, call 609 494 7211 or stop into visitor center at 265 W 9th Street Ship Bottom. Follow on facebook as Southern Ocean County Chamber of Commerce and on all social as LBI Region. Pick up the 2015 LBI Region Escape Guide, the official visitor guide of the area at NJ Welcome Centers, Southern Ocean Visitor Center, Vacation Rental packets or online through chamber website.